5:30 - 6:30 pm, Vaping presentation for parents/guardians: The e-cigarette craze has catapulted the largest uptick in teen nicotine use in decades after years of driving cigarette smoking rates to record lows. Teens who would have never smoked cigarettes now are inhaling fruity flavors, often without realizing it is packed with nicotine, a dangerously addictive substance. The Centers for Disease Control and Prevention (CDC) strongly cautions about the growing teen addiction and the harm posed to adolescents' brain development. Our Back to School Night speaker D.J. 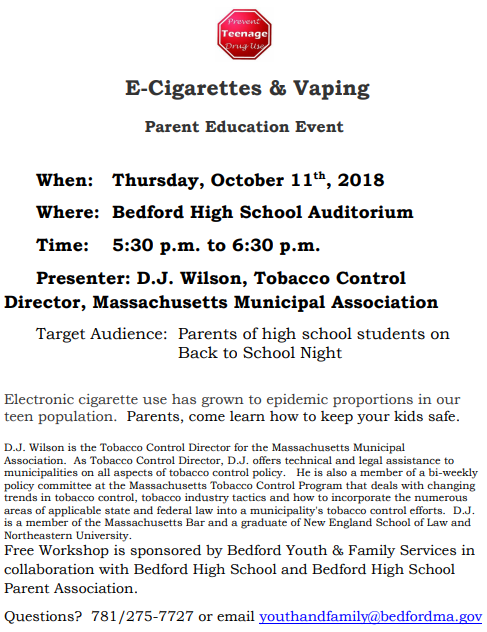 Wilson is the Tobacco Control Director from the Massachusetts Municipal Association and will educate us regarding the perils of vaping. Very special thanks to Bedford Youth and Family Services for sponsoring our Back to School Night speaker. See this PRESS RELEASE for more information. 7:05 - 8:39 pm, Follow your Student's Class Schedule: Parents/guardians, walk in the shoes of your student(s) to hear about the classes directly from teachers and learn how taxing it can be to travel the building to various classes. The student should fill out the Back-to-School Night schedule, which can be found at https://goo.gl/b3NumQ. It's a cross-section of two days of classes. Parents/guardians will rely on the schedule from 7:05 - 8:39 pm. 5:15 - 8:45 pm, Delivery of Student Directories: pre-orders will be available for pickup. If you didn't pre-order, you can walk up and buy while supplies last. At the BHSPA table in the BHS lobby. Parking: There is a home soccer game that evening so parking may be tighter than normal. The bus loop also may be busy when our other sports teams return from their away games. To steer clear of bus traffic, consider parking in the back lot of BHS or around the Public Library or Police Station.